Some stunning news out of EVO 2018 as Bandai Namco announce Negan from The Walking Dead will be added to the roster of Tekken 7. The official announcement came at the end of the Season 2 Pass trailer the company showed off before the championship round, which included the return of longtime characters Anna Williams and Lei Wulong, with some famous words by Negan at the end as the last character who will join this season and three more to come. No word yet as to whether or not Jeffrey Dean Morgan will voice the character. Enjoy the trailer below! Introducing a brand new lineup of warriors stepping into the Tekken 7 ring! With Season 2 of the Tekken 7 Season Pass, fighters such as Anna Williams, Lei Wulong and Negan from AMC’s The Walking Dead join the fight! 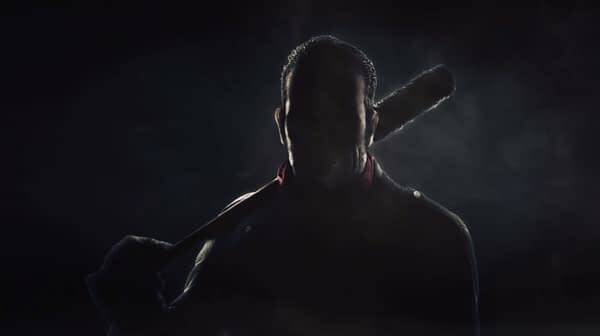 Your eyes do not deceive you, your pounding heart does not betray you; Negan from AMC’s The Walking Dead is making his way into Tekken 7 to deal a world of pain in the Tekken universe. Negan, beloved by fans of The Walking Dead for his charismatic yet sinister demeanor, is ready to destroy all challengers, regardless of their stature in the Tekken universe. As the personal bodyguard of Kazuya Mishima, Anna Williams is a beautiful and intelligent officer with deadly fighting skills, and serves to drive her sister Nina crazy! Lei Wulong makes his long awaited return to Tekken, sporting new digs and his deadly Tiger, Crane, Leopard, Snake, and Dragon styles!